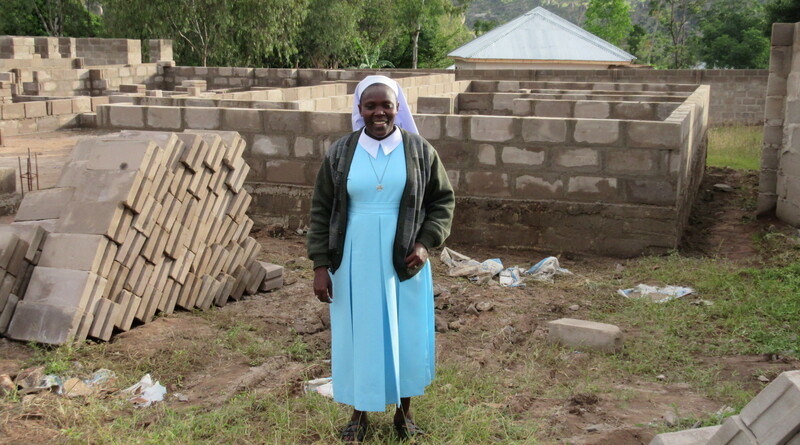 If you had told me three years ago that our move from Portland, Ore., our home of 17 years, to Marshfield, Wis., would eventually lead to the construction of a convent in Tanzania, I would have said, “Oh, dream on!” But, as our friend Sister Sabina Kabuga would say, “Mungu Ni Muweza Wa Yote,” which means, “With God, all things are possible” in Swahili. This phrase has guided her order, the Sisters of Our Lady Queen of Africa (SOLQA), our family and St John the Baptist Church in Marshfield throughout a miraculous journey to build a new convent for the sisters in Mwanza, Tanzania. We met Sister Sabina at a class on Ignatian spirituality in 2011, stepped out of the way of the Holy Spirit and let a friendship flourish. Her deep faith, laughter and willingness to share her story and ask for help … this powerhouse of a nun was the real deal! Her order runs an orphanage, a boarding school for girls and health and social services for impoverished rural communities in Tanzania. They live in deep poverty and need help. We had just started laying the groundwork of support for the sisters at our local Portland parish when we relocated to Marshfield, Wis., in July 2013. We would have to start ALL over again! In February 2014, with St. John’s Pastor Father Samuel Martin’s blessing, we introduced Sister Sabina to the parish community via Skype. St. John’s Parish wholeheartedly embraced her and the idea of support for Sisters of Our Lady Queen of Africa. The first concern was the living conditions for the sisters. In Mwanza, it was so awful that, for example, they were cooking on a charcoal stove inside the house, and bathing over a hole in the floor with a bucket of water! St. John parishioners became friends in Christ with Sister Sabina and all the Sisters of Our Lady Queen of Africa. Who wants their friends to live like this? Father Martin asked me to coordinate the St. John the Baptist Mission Committee. The Holy Spirit led me exactly where I needed to go and what happened next was frankly miraculous! A phenomenal group of humble dynamos, with experience in all aspects of event planning, fundraising and prayer, came forth and got right to work by hosting Sister Sabina’s July 2014 visit to Marshfield. Donations flooded in, ranging from $2 to $2,000, all given in anonymity, for a total of $15,000 in just two months. Next, the Cooking Up a Convent cookbook sales, the Marshfield Parish Tractor Pull, numerous efforts by the St John’s PCCW and other fundraisers brought the total to $76,000, which was sent to the sisters by October 2015! The generosity within this parish community and around the diocese was just incredible, with continued outpouring of donations. Then, in November 2015, we received an anonymous donation from a reader of the Catholic Times who wanted to do something for the Divine Mercy Convent. After seeing our articles about the convent project, they prayed about it, consulted with Father Martin about the funds needed and decided to donate $20,000! Less than 18 months after Sister Sabina’s visit, we had raised more than $100,000! What gives the project such meaning, though, is sharing the joys and sorrows of life with our Tanzanian friends. Sister Sabina and Sister Eddy enthusiastically report when a new wall goes up or the roof is finished. For Sister Sabina’s Jubilee celebration, a St. John’s parishioner organized a spiritual bouquet, consisting of more than 2,000 prayers; and when Sister Sabina’s mama passed away, we all prayed with her. They have left a lasting impression on our parish and we want to continue to stay invested in their lives. In the spring of 2015, this beautiful structure had really taken form! The sisters named it the Divine Mercy Convent because, back in 2013, they devoted many novenas of the Chaplet of Divine Mercy to ask God to lead the way to building the convent on the land that the sisters purchased (by taking out a $5,000 loan). The sisters hope to open the Divine Mercy Convent in this Year of Mercy. Yes, Mungu Ni Mweza Wa Yote, when we let his divine mercy do its work, inspiring friendship, prayer and generosity. 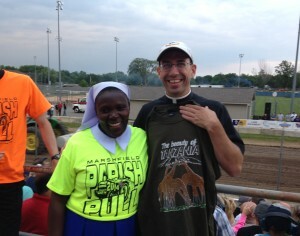 Sister Sabina and Father Martin from St. John the Baptist Parish in Marshfield enjoy sister’s first Tractor Pull during her visit in 2014. Now that we BUILT the Divine Mercy convent, let’s fill it! Before the sisters can move in, they still need: Water tanks, a solar panel, an electric stove and furniture. The sisters have been wise and prayerful stewards of the funds donated, giving us updates and photos each step of the way. All of the donations go DIRECTLY to construction – no middleman! attn: Divine Mercy Convent, or by contacting the Parish office at 715.384.9565, ext. 2. God of all courage, help us to walk along side our sisters and brothers in Tanzania as they struggle to feed their families and live their faith. We know you hear the cry of the poor and call on us to live out your desire for charity. May we, through prayer and action, show your love for the people in need around the world as we share our bread with the hungry.